The volumes in this set, originally published between 1940 and 1994, draw together research by leading academics in the area of welfare and the state, and provide a rigorous examination of related key issues. 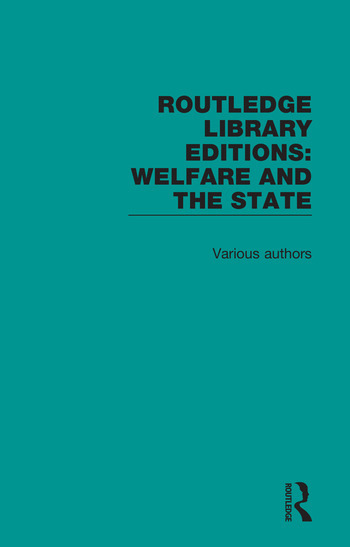 The volume examines the concepts of welfare in relation to the state through the areas of policy making, social administration, class division and social inequality, social policy and privatization, whilst also exploring the general principles and practices of the welfare state in various countries. This set will be of particular interest to students of sociology, politics, economics, social work respectively. 1. Approaches to Welfare, edited by Philip Bean and Stewart MacPherson. 8. Self Help in Health and Social Welfare: England and West Germany, edited by Stephen Humble and Judith Unell. 21. Social Welfare: Why and How?, edited by Noel Timms. 23. The Unservile State. Essays in Liberty and Welfare, edited by George Grimes Watson.